Rhodes island in Greece. Lindos. Faliraki. Tsambika. Accommodation. Beaches. Rhodes belongs to the Dodecanese Islands, and it is Greece's fourth largest island to the surface (1401 km2) and has 115,500 inhabitants. Only Crete, Evia and Lesvos are bigger. Rhodes is so large that it required many trips before you get to know the island, especially the southern parts that are not frequented by many tourists. Highest mountain is Ataviros and measures 1 215 meters above sea level. Nearest neighbouring islands are Chalki and Symi. The Cape of Rhodes town where Windy beach and Elli beach meet each other. For many, Rhodes is almost synonymous with Greek tourism, everyone has heard about the island, and many Scandinavians have been here on holiday. 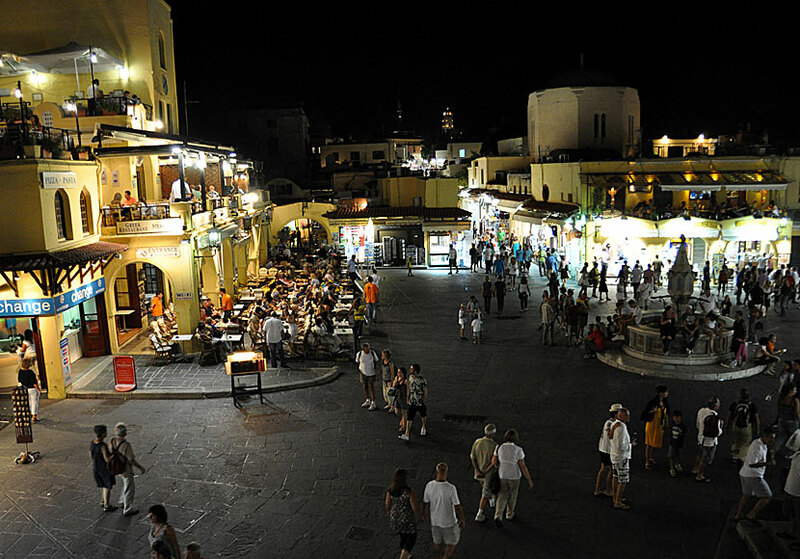 That Rhodes is popular is not surprising, here are almost everything you could wish for, especially a lot of nice beaches, a lively nightlife, great shopping and a historically significant heritage. The majority of the tourists go by charter to Rhodes. Charter companies offer hotels at many places on the island; if you have difficulty to choose, Rhodes town is a good base. If you choose to go on your own there are many possibilities, the easiest is of course to travel by air directly to Rhodes. 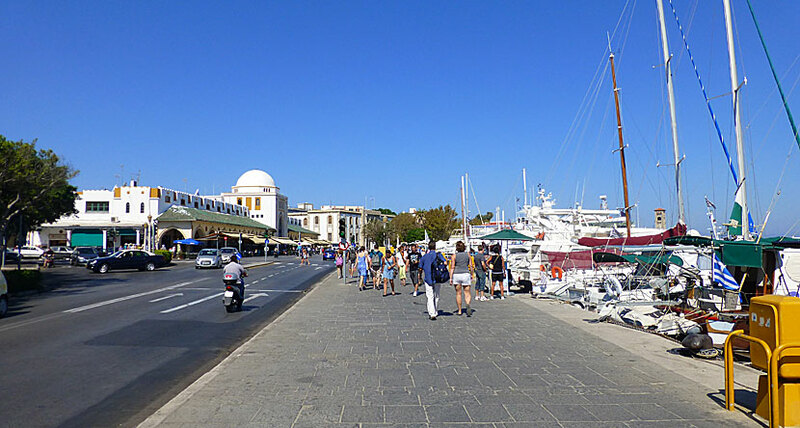 But if you go some were else, the boat connections to and from Rhodes is very good, especially between the islands of the Dodecanese, but also with some of the islands of the Cyclades, and with Crete and Athens' port city Piraeus. Mandraki port in Rhodes Town. Rhodes is, as said, a very large island with many inhabitants and of course that is thrown back on the traffic, which is pretty intense; especially in and around Rhodes town and on the highway to Lindos. Bus services are good. Car, moped and bicycle rental services are almost everywhere. Excursion boats to the neighbouring island Symi, leaves every morning from Mandraki port. In such a large island like Rhodes there are naturally lots of villages. My favourite village is Rhodes old town and Salakos. Rhodes town consists of a newer and an older district. The new part of Rhodes town is a noisy thing with a lot of traffic and large hotels. A huge contrast to the old town and it feels almost unreal to go from one part to the other. In the new neighbourhood of Rhodes you find the two ports, so it is the new part you first become acquainted with if you arrive with boat. Hippocrates Square in Rhodes Old Town. At the entrance of Mandraki Harbour it is believed that the famous lighthouse, the Colossus of Rhodes, stood statue. Continuing a short distance to the north you come to the third largest casino in Greece and the beaches Windy and Elli beach (see also picture at the top of the page). Far north, where east and west meet, is a yellow building that is good to have as a landmark. In the building's lower floor is an aquarium. 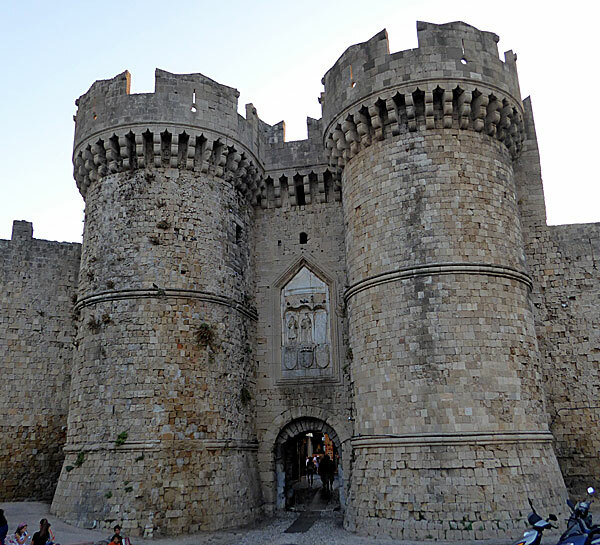 Rhodes old town is from the Middle Ages and is one of the most spectacular districts I have been visited. I think Rhodes old town is in the same class as the old town of Krakow and the old town of Prague. Certainly it is super touristy and commercial in some areas, mainly around Socrates street and in the area around Hippocrates Square, but that I happily forgive. Marina Gate - one of the entrances to Rhodes Old Town. Sights you should not miss are: Avenue of the Knights, the Palace of the Grand Masters, the Jewish and the Turkish quarters, mosques, the bell tower and the moat. The absolute best way to see and learn to know the old town is to walk around at random. If you want to get away from the tourist areas, I can recommend the south parts of the town where the Jewish Quarters is situated. Lindos is the most visited spot in Rhodes, few tourists leave from Rhodes before they have paid a visit here. 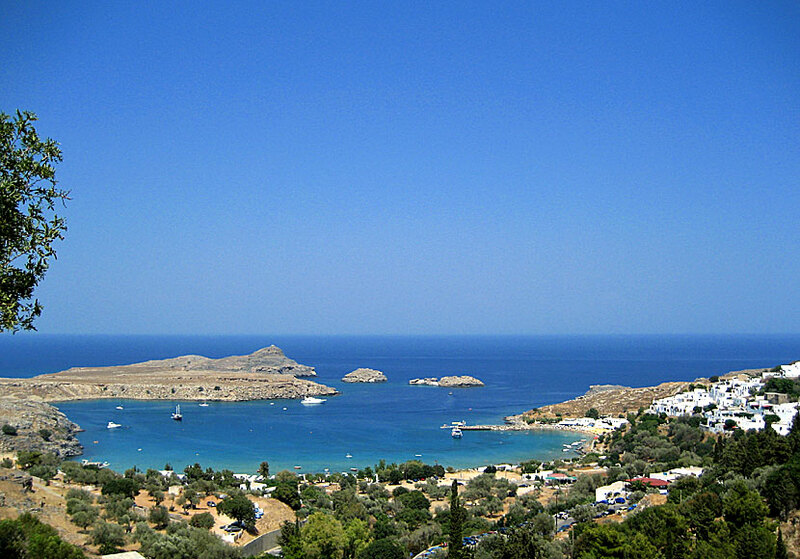 It is not only the village of Lindos that attracts, the beach below and the Acropolis above also tempts. No one leaves Rhodes without visiting Lindos. You will notice it, I promise. Here is almost always extremely crowded, everywhere. It is even that bad that you sometimes have to queue to even come into the village. To get a better and more nuanced picture of Lindos you should go early morning or late at night. The 116 metre high Acropolis is one of Rhodes 'you have to see'. The first thing you become aware off is that it is so small; from a distance it looks much bigger. The second you become aware of is that you understand exactly why they built at this spot; a more impregnable place is hard to find. Among the most interesting monuments include the Doric temple dedicated to Athena Lindia, and the Hellenistic stoa. Rhodes has some of the best beaches in Greece. 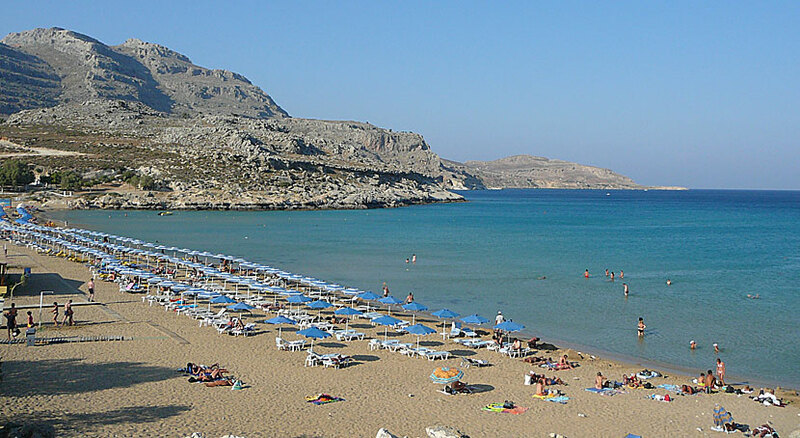 The many fine beaches are one of the reasons why Rhodes is still so incredibly popular. Some of the beaches are described below. 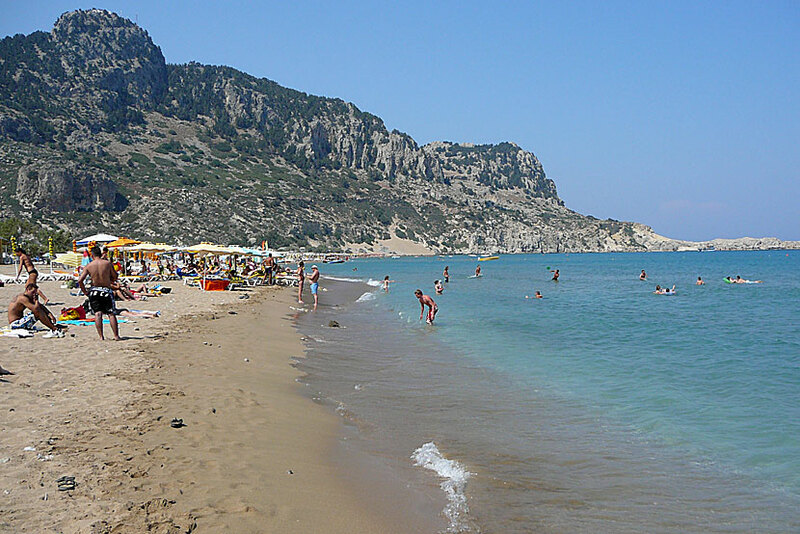 Other beaches are Haraki, Agathi, Fourni, Traganou, Afandou, Kolymbia, Stegna and Prasonisi. Agathi is one of many fantastic beaches. Kalithea is situated in a small bay where there is an old Italian spa. The beach itself is not much to boast about, it's just a small strip of beach, but the bay is boarded with beautiful rocks and the water is inviting. 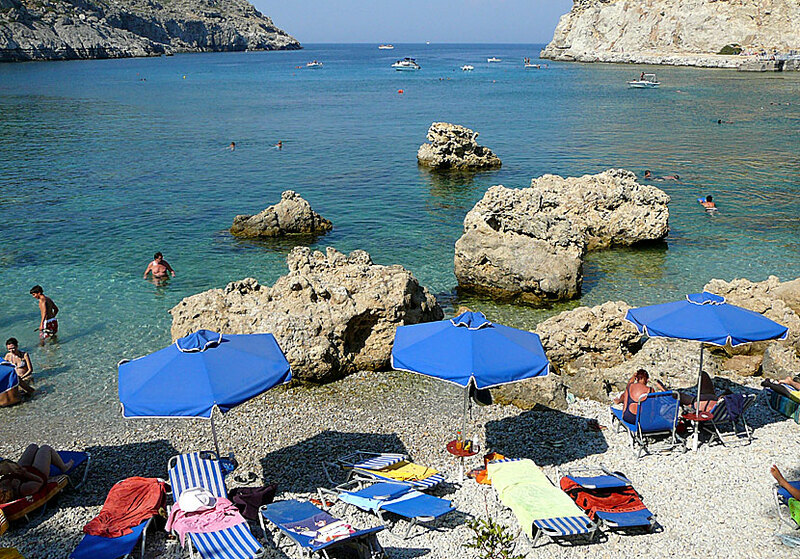 Anthony Quinn beach is one of Rhodes' most popular beaches and it is easy to understand when you are there: small sandy beaches separated by rocks, the water in the bay is often as smooth as a mirror and extremely tempting. One can dive directly from the rocks and snorkelling opportunities are excellent. 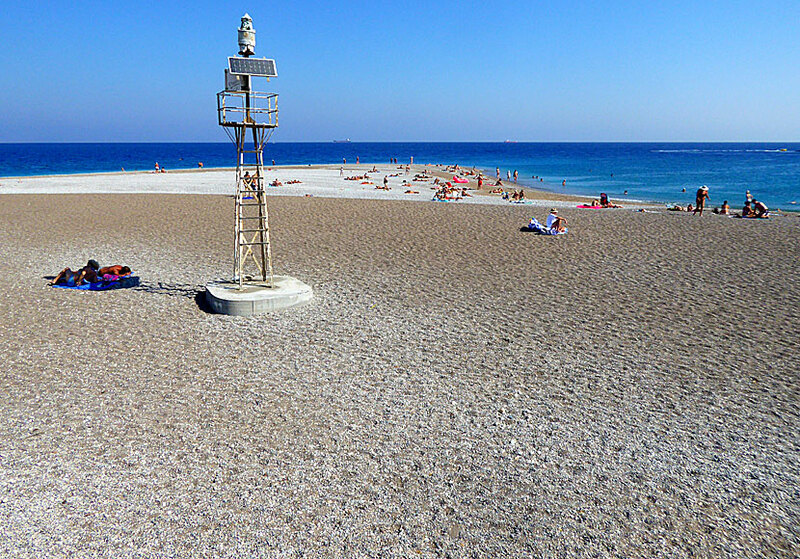 The completely fabulous sandy beach of Tsambika is one of my favourite beaches on Rhodes. It would definitely be the island's best beach if it were not so incredibly popular and well visited. The beach is long, the sand is fine as powder and the bottom is lovely. The water is shimmering in blue-green and amazingly inviting. Tsambika is simply a great beach and a paradise for families with children. The Old Town is the brightest star among all of the sights in Rhodes. But there are other attractions that should not be missed, as the mountain Profitis Elias, Monte Smith above Rhodes town, excavations at Kamires, Valley of Butterflies and the springs Epta Piges (Seven Springs). And of course, Lindos and Acropolis. 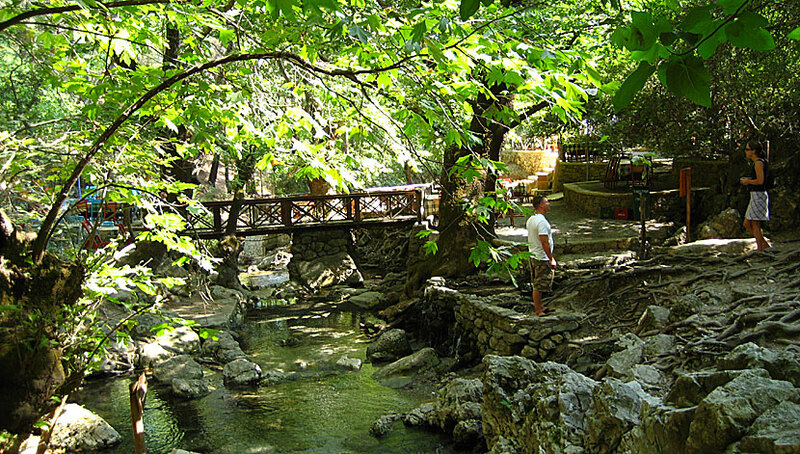 Epta Pigesis is an oasis in Rhodes. We always stay at Kristinas Rooms in the old town when we visit Rhodes. This traditionally built house with six newly renovated studios is located in quiet area of Rhodes old town. The guest house includes a large terrace with great views over the harbour, and a lush garden furnished courtyard. Kristinas Rooms is owned and operated by Johan from Sweden They are very friendly and do everything to make guests feel comfortable.